Looking for cheap car hire at Fresno Yosemite International Airport, California? Search and compare prices of a huge number of car hire suppliers who offer pickups at the airport. Simply type in Fresno Yosemite International Airport and select your preferred dates, vehicle and the age of the main driver, then hit the button to get a quote, compare prices and book online. Situated close to the bustling Fresno, visitors arriving at Fresno Yosemite International Airport have a plethora of public transport options to choose from, but the best way to really explore the region is by hire car. Located 60 miles away from Yosemite National Park in California's Fresno, Fresno Yosemite International Airport is a hub for many car hire companies. 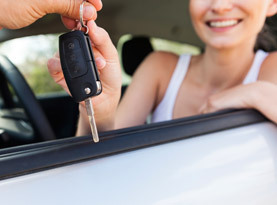 It is a good idea to book your hire car in advance in order to guarantee a vehicle and to save you the hassle of finding a good deal upon arrival. On picking up your hire car at Fresno Yosemite International Airport you can head straight to the historic downtown areas of Fulton Mall and Chinatown to soak up the local atmosphere. By hire car is also the best way to explore the prestigious community of Old Fig Garden, set on Fresno's fringes, and with your hire car you can drive to the world famous Yosemite National Park. Fresno experiences mild winters and hot summers and with temperatures peaking during the summer months, the seasons either side of summer are perfect for exploring Fresno's surrounding attractions such as the Forestiere Underground gardens.